Basketball legend Earvin (Magic) Johnson imparted a business lesson to those attending his afternoon keynote at the ProMat 2017 trade show in Chicago: Give customers what they want, how they want it, and then over-deliver. 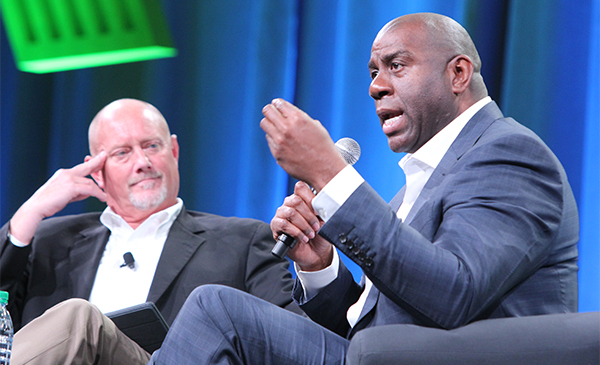 Basketball legend Earvin (Magic) Johnson gave the audience insight into his business success at his afternoon keynote at the ProMat 2017 trade show. In a one-on-one chat with Mitch Mac Donald, group editorial director of DC Velocity and CSCMP's Supply Chain Quarterly, Johnson, who became a hugely successful businessman and prominent health policy advocate after his playing days ended in 1991 after he was diagnosed with the HIV virus, said his penchant for discipline and perfectionism exhibited on the basketball court carried over into his business life. He also learned to gauge the needs of his customer base, notably when he defied the skeptics and opened a chain of movie theaters and Starbucks coffee locations in inner city areas that many thought couldn't support those businesses. "People said there was no way minorities would pay $3 for a cup of coffee, but we like coffee, too," he told the audience. As for his string of movie houses, Johnson gauged that moviegoers in inner city neighborhoods liked combining dinner with a film, rather than eating before or after the show. "We weren't going to have dinner and a movie. We were going to have dinner AT the movie," he said. "Always listen to the customer, and think of them first," he said. That, combined with overachieving execution, "gives you the customer retention you are looking for," he said. Johnson's newest challenge is to revive the flagging fortunes of his former team, The Los Angeles Lakers, as its head of basketball operations.